Nihon Falcom has officially revealed the PlayStation 4 port of The Legend of Heroes: Trails of Cold Steel II, which is titled Sen no Kiseki II Kai -The Erebonian Civil War- in Japan. Following Falcom's plan to bring the entire Trails of Cold Steel series to the PS4 within their current fiscal year that ends September 2018, they're releasing this port of the second game on April 26; not long after Trails of Cold Steel I -Thors Military Academy 1204- release on March 8. As with the first game, this will also have enhanced audio quality, 4K resolution support, 60fps framerate, and a Turbo Skip Mode option. A save data from the currently released Trails of Cold Steel III can also be used to unlock New Game+ bonuses early. Those who still have the save data of the original Cold Steel II release on PS3 or Vita can also bring it to the PS4 version. And all of the 102 DLC items are already included in this port. Falcom also confirms that Trails of Cold Steel II -The Erebonian Civil War- can read a cleared save data of Trails of Cold Steel I, including that from the PS4 port -Thors Military Academy 1204-. However, they posted a note that the cleared save data from the PS3/Vita version of Cold Steel I must be saved before the Final Breakthrough at the final chapter, Defense of Trista. 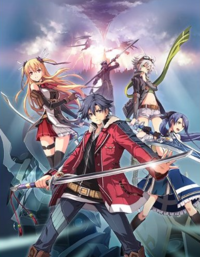 Unfortunately, Falcom has not confirmed yet on whether the save data from this game can be read chronologically in Trails of Cold Steel III or not. The Legend of Heroes: Trails of Cold Steel II -The Erebonian Civil War- for PlayStation 4 will be released in Japan on April 26. As with the first game port, no English localizations have been announced as of yet.